Adrienne of The Rich Life (on a budget). Photo by Sylvia Steininger. Happy 2014! 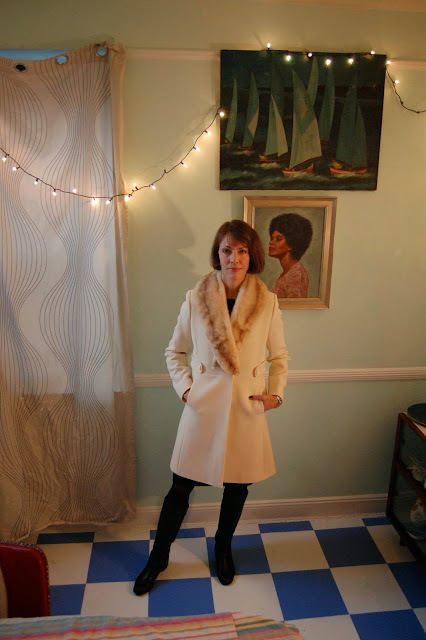 The winter season made it so easy for Adrienne of The Rich Life (on a budget) and me to pick coats as our theme for this month’s “How I Wear My.” It seems especially timely since much of North America is in the midst of a “polar vortex”! The range of coat photos we received made us realize that your definition of a coat may depend on where you live. Californians and Floridians think about coats in a different way than somebody who lives in Alaska or Minnesota or the U.K. No matter what your take on a coat - from capes to utility jackets, from full-length furs to mid-length car coats - wearing one is a terrific way to get through the winter in style! She could definitely transport this look right to where I’m at in Brooklyn (once it warms up). This is an outfit that easily translates coast to coast! Teresa. Photo by Denton Taylor. It has been so cold in New York City lately that this is exactly what you need to step outside! 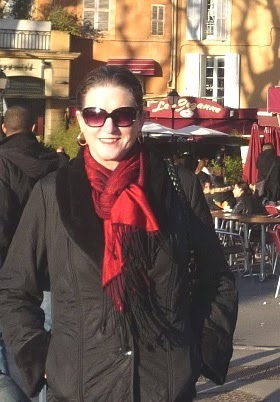 And I am digging those Balenciaga sunglasses, another Christmas present to Teresa from Denton. When I saw this Diana coat by Buddhaful on Aya of Couturgatory I actually gasped because I LOVE this look on her. The coat feels so Old World, with the lace trim and laced sleeve detail, and yet modern, with a zip front and an asymetrical hem and shoulders, and I adore how Aya has paired it with a full white skirt, flower necklace, and shoes right out of the 1920s. Gorgeous! Talk about a mood lifter. I love everything that is happening here, especially the mix of colors and textures and the giant snowflake on the fur scarf! Kelly of Grunge Queen is wearing a late-1930s/early-1940s vintage jacket she borrowed money from her sister to buy when she was just 19! Ah, the things we do for fashion love! I am a big fan of the way she has styled it, it reminds me of pictures of Audrey Hepburn in the late 1960s. Don’t you love those white lace tights and white shoes? Sheree of It’s Not That Deep. Sheree of It’s Not That Deep looks amazing once again in a beautiful vintage coat and a chunky knit scarf. I love this combination on her, especially with the addition of that clutch tucked under her arm. I am loving that bright color against those patterns. And I never get tired of pink and black! 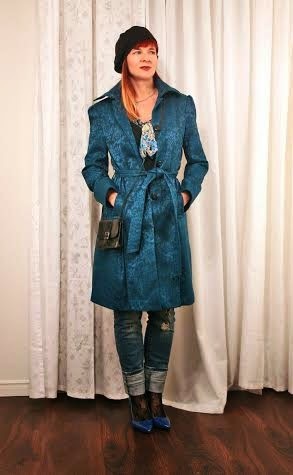 Oh do I love this coat worn with two-tone platform heels and a cloche. Who says it’s all gigantic down coats and heavy boots in Alaska? Nicole proves otherwise! 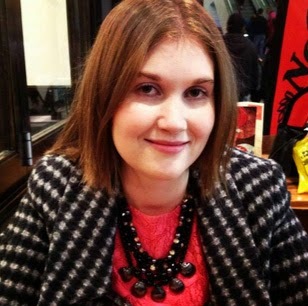 Natalia of In the Writer's Closet. I love this color on Natalia and that she shared sale and fit info with us. I also love all the colors in this picture with the coat, balloons and gumball machines! You know I live for a peacoat so I can’t resist this look! Suzanne of Suzanne Carillo Style Files. 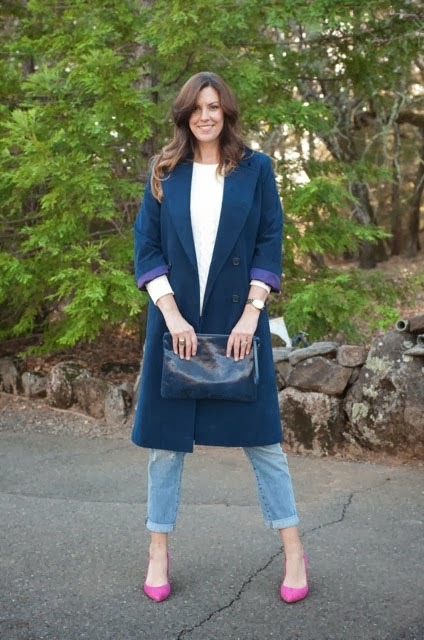 Suzanne of Suzanne Carillo Style Files is wearing a trench in one gorgeous shade of blue. The pattern of it reminds me of impressionist paintings and I love that everything she selected to wear with it is blue or black, which gives the whole look an interesting depth. 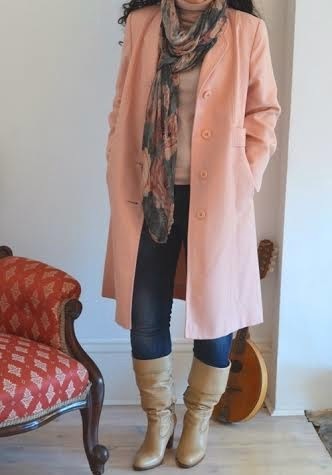 I agree with Charlotte, a classic coat, like the one shown here, and worn in a way I would wear too, is always age-appropriate and never goes out of style. I love the addition of an elegant brooch pinned to the lapel. Veshoevius of The Taxonomy of My Wardrobe. Me too, what a great shade of pink! This is the kind of coat that gives me a little boost to see someone wear on dreary winter days. And how wonderful of Vix to send it to Veshoevius out of nowhere! I think bloggers are some of the most generous people on the planet. Anne of Music and Markets. Oh lucky Anne, to be traveling the world and to buy key wardrobe pieces along the way! Cyrillynn of Any Second Now. Cyrillynn of Any Second Now lives in San Diego, where I grew up, and I can attest to many mild winters there as a child! She very stylishly proves my point that a coat is a different thing to different people in different parts of the world. And in San Diego a coat can be a cape (this one from Talbot’s) and you are set for the winter! I am so digging the houndstooth mixed with stripes and skinny jeans and tall black boots. And don’t you love that gorgeous dark pink bougainvillea behind her? See what I mean about these Southern Californian babes and their take on a coat? And unrelated side note: The next time I look for a utility jacket I am going to skip J. Crew and go straight to Sandro. Sue of A Colourful Canvas. 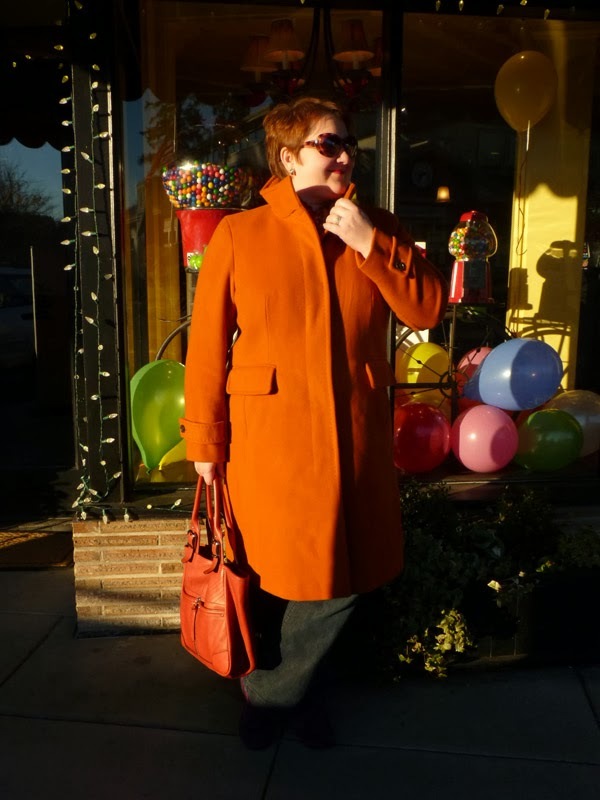 Sue of A Colourful Canvas is wearing a great (and thrifted!) blue coat by London Fog. I love it so much with those apple-green Hush Puppies and chunky green knit scarf. A tip of the hat to you, Sue! This is such a divine ladylike look, made even more elegant with the addition of black lace tights and (I’m sure) vintage alligator bag, its handle wrapped in silk! Orange is definitely one of Pam’s colors and I have thought so for awhile now so I’m glad to see her in an orange coat. The fact that the coat is no longer made makes it even more special. Julia of Lessons With Oscar. I toast to this look, pattern mixing, and wearing things that don’t go together. Liz of What Liz Loves. I could see this paired with something dressy too; what a great multitasking jacket! A J. Crew coat in Sea Salt and added fur collar. Photo by G. Keresty. I fell in love with this J. Crew coat a few years ago, and even went so far as to try it on in the store but ultimately didn’t buy it. A cream-colored coat? And I live in Brooklyn? Really? When I found it on eBay for less than the retail price a few months later I broke down and bought it. I know a cream-colored coat is not the most practical for NYC but I can’t help loving a pale hue in winter. The collar is an add-on and was one I literally found on the street. Here in Brownstone Brooklyn there is a time-honored tradition of putting anything you don’t want out on your stoop for a passerby to take and enjoy. You can find it all—books, clothes, kids’ toys, kitchen equipment, fur collars! This collar had a homemade price tag attached and I know the lady who set it out so I’m pretty sure she offered this at a stoop sale, no one bought it, and she decided to give it away. It looked so elegant draped over her black iron gate as I walked by one morning, and I knew if I didn’t take it right then it would be gone within mintues. Sold! From what I can tell by the tiny snaps on the reverse side, it was the detachable collar for a sweater. It looks great over my black J. Crew coat too. As for the portrait behind me, my friend’s mother painted this in a studio class at The Art Students League of New York. Isn’t it amazing? I love that picture and I think Gwynne’s mother is a very talented portrait artist! Under the coat I kept it simple and dressed in black! Let me know if you have been living under this Polar Vortex like we have in New York City! It has been the coldest weather since I moved here in 1996. For February please put on your rose-colored glasses and join us for “How I Wear My: Pink”. All shades of pink are welcome—from the palest pink you’d find on a peony to the most lurid Pepto-Bismol shade you can handle, and everything in between! Adrienne and I will accept pictures until February 3, 2014. Do head over to Adrienne’s to see even more amazing coats. You look so chic and glam Jill...gorgeous addition with the fur and that color is stunning! 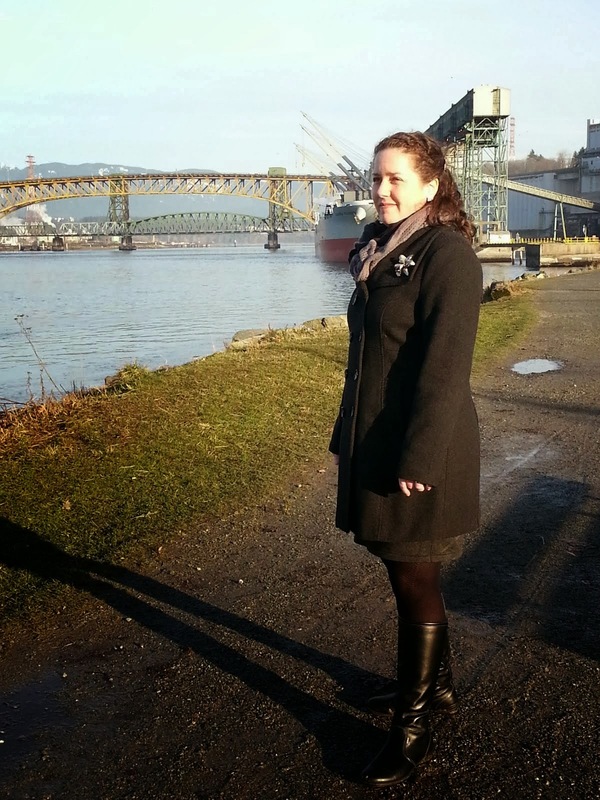 Thanks for featuring me love..
Love seeing everyone's coats and the variety of beautiful styles! Jill, your light coat looks amazing, so elegant. I hope your Polar Vortex gets tired and goes home soon. Good morning Jill! I'm loving these looks today. So many different types of coats. We have been so warm on the west coast that coats are more of an after thought. Thinking of you all in the deep freeze. I adore that look on you-what a find in that fur collar. Hoping it warms up by April or so ;). Jill, I meant it when I said on my post that you look like a celebrity. You really glow in that coat. So gorgeous! Everyone is looking fantastic - Aya's coat is so uniquely beautiful and I love Veshoevius's pink coat. So many great looks, I would be here all day mentioning them all. Looking forward to seeing all the pretties in pink next month! All the ladies look lovely as always! I love all the different colors and styles of their coats. Your coat is so timeless and what a great find on your collar. Jill another stylish roundup to be sure! I sure admire the amount of time and effort you and Adrienne put into this event each month! You, my dear look the vision of chic elegance in your fur collared coat! Such a lovely story how the collar made it's way to you and found such a loving home. Thank you again for hosting this monthly roundup! Stay warm … and I'll happily be back next month … I adore all shades of pink right now! Jill, I love your fur collar... I ALMOST chose a photo with a very similar fox collar, an heirloom from my grandmother. 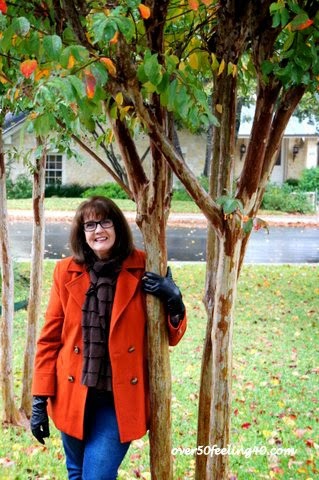 I've really enjoyed all the beautiful coat photos on your and Adrienne's posts - thanks! What a great group of women. I find these posts so much fun. You two are so wonderful to host these posts. Love the refined and elegant look of your JCrew coat, the colour oozes quality and the fur adds just the right amount of zing. That is so cool that you scored that collar for free. I think it really adds a retro look to the chic JCrew coat. You are very brave wearing such a light colour in winter. Seeing all of these different coats and how women wear them is so interesting. Shows that fashion and style definately extends to outerwear. I am especially in love with the Target coat that Tamera is wearing. Somehow when she wears it she makes it look so much more expensive. Also that pink coat Veshoevius was gifted is simply divine. What a treat. I am trying to keep warm here. The weather is the worst we have experienced since we moved here some 15 years ago. Thankfully tomorrow we are expected to be above freezing. Thank you for hosting, Adrienne and Jill! Everyone's coats are so beautiful. Maybe it's my obsession with outerwear speaking. Your coat is so lovely! The fur collar is a seamless addition; I didn't realize it had come separately, and the story behind it makes it even more awesome. I hear you on the cream- I love coats in that color so much, but it's difficult to keep clean where I live! Thank you so much for hosting! Everybody has such wonderful coats and as a certifiable coat nut, I want one of everything :-) Jill, yours is divine, a fur collar coat is always so lovely especially in a pale colour - 2 beautiful finds!!! What a fantastic selection. Thank you so much for featuring me again. I hope all you lovely American ladies are managing to stay warm during this cold snap. 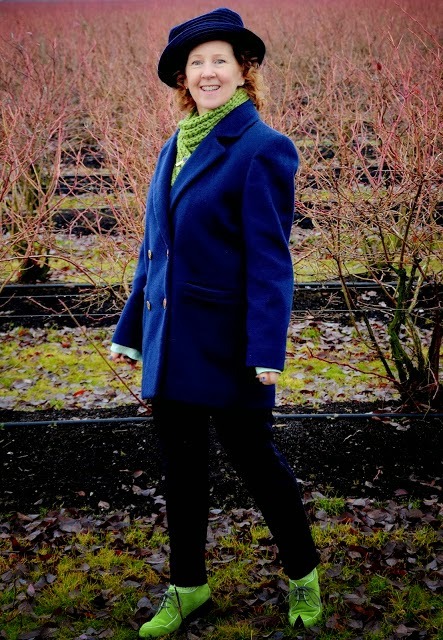 Hi Jill, a big thank you for featuring my coat in your How I Wear My post. I have to be honest, I had to pick my jaw up from my keyboard when I saw your beautiful cream coat! I love it!!! I know it may not be super practical to wear light coloured outerwear, but in a sea of black, and dare I say navy, the creaminess that is your coat, is like candy for the eyes! And the wrap...looks like it was made just for that coat! Thank you again, Jill and Adrienne, for hosting such a wonderful party for all of us! It's very inspiring to see all the girls in their pretty coats in one place - many ideas, many smiles all at once! Great project!! And you are sooo lucky to get your mink collar for free :) You look amazing in your coat with this collar! Love this post and seeing all the different coat styles. I can't imagine how cold the Polar Vortex would be even though I'm in Switzerland, I've never seen anything look so cold as the news in NYC and Chicago this week. All the coats with the fur trimming are so chic and I really want the look of 'Not That Deep' and Adrienne of 'Rich Life Budget.' You look beautiful and thanks for sharing all the coat ideas! My dear Jill and Adrienne, happy New Year. Love and sunshine wonderful friends. 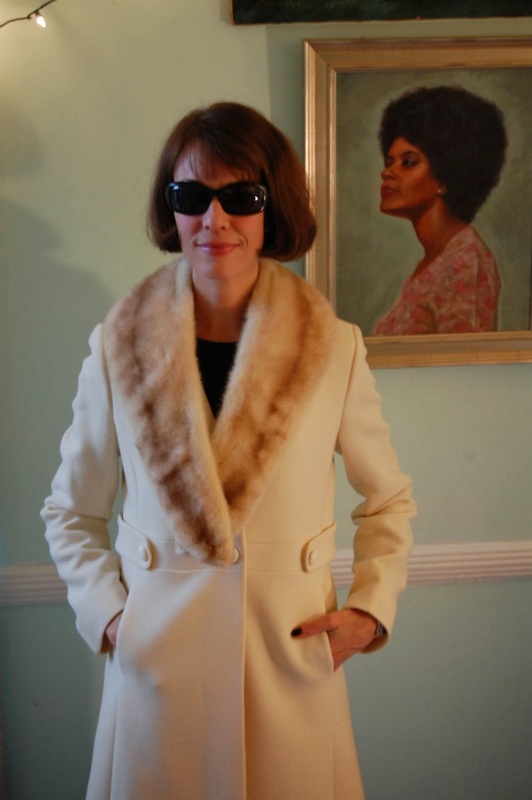 Hi Jill, I loved your cream-colored coat, as you know, since I own a similar item, but I LOVE, LOVE, LOVE the collar! I enjoyed seeing the many coat options this time around. Living in a cold climate now I am able to wear more layers than when we lived in Florida and there is much inspiration here. Thanks to you and Adrienne for hosting. I'm too slow getting by to say thank you for including me! I will, I swear, get by to everyone on your list this week to say how much I enjoyed their company! Have a great day, month, week and year! I love, love, love the HIwM-category! All these lovely ladies and their very own stylish way. Great inspiration! I always plan to join and send a photo..well, maybe sometime I'll finally remember to do so in time. Nice post. Lovely to see all thise different coats and so many familiair faces. As I know quite a few of your coat participants (bloggingwise that is). Tamera's golden coat, emerald scarf, and bold snowflake jewels come together amazingly. I could never do it myself, but I can't stop looking at the ensemble. And Jill, I loooove your cream coat, the pale fur collar, and your idea of adding them together. What a happy find! Did you show your creation to the lady who set it out? Hi everybody, thank you for so many kind comments! And thank you, always, for everyone who took the time out of their busy days to join us. Adrienne and I appreciate it so much.